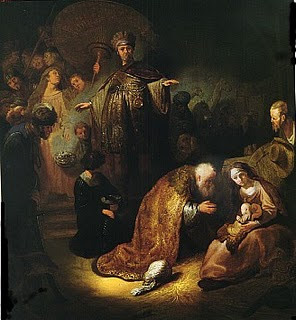 Rembrandt: "The Adoration of the Magi"
1 Now when Jesus was born in Bethlehem of Judaea in the days of Herod the king, behold, Wise-men from the east came to Jerusalem, saying, 2 Where is he that is born King of the Jews? for we saw his star in the east, and are come to worship him. 3 And when Herod the king heard it, he was troubled, and all Jerusalem with him. 4 And gathering together all the chief priests and scribes of the people, he inquired of them where the Christ should be born. 5 And they said unto him, In Bethlehem of Judaea: for thus it is written through the prophet, 6 And thou Bethlehem, land of Judah, 7 Then Herod privily called the Wise-men, and learned of them exactly what time the star appeared. 8 And he sent them to Bethlehem, and said, Go and search out exactly concerning the young child; and when ye have found him, bring me word, that I also may come and worship him. 9 And they, having heard the king, went their way; and lo, the star, which they saw in the east, went before them, till it came and stood over where the young child was. 10 And when they saw the star, they rejoiced with exceeding great joy. 11 And they came into the house and saw the young child with Mary his mother; and they fell down and worshipped him; and opening their treasures they offered unto him gifts, gold and frankincense and myrrh. Gostava de lhe enviar uma informação de sustentabilidade relacionada com uma empresa portuguesa, no entanto não encontro os respectivos contactos. Se mos pudesse facultar, agradecia.